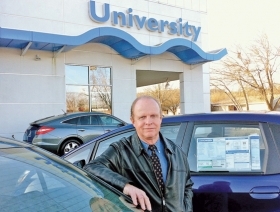 Age: 60 Dealer since: 1985 Dealership: University Honda, Corvallis, Ore. Average monthly Honda sales: 25 new, 25 used Quote: "Dealers are satisfied, but we are very aware that the competition is closing the gap and we want Honda to reassert our leadership. We want to get back to the big numbers." The conventional wisdom was that Honda should have capitalized on the Toyota brand's recall troubles. But with overall retail sales still slow, an aging product and an aversion to fleet sales restricted Honda from keeping pace with the industry. With two volume products slated for redesigns, 2011 may be the year Honda gets its groove back, hopes Ron Theis, chairman of the Honda Dealer Advisory Board. Whereas most Honda dealers rack up big sales, Theis admits his University Honda in Corvallis, Ore., is small-time by comparison. Theis spoke with Staff Reporter Mark Rechtin. Q: How was 2010 for Honda dealers? A: It ended on a pretty optimistic note. Dealers are notoriously optimistic, and December Honda sales were up 18 percent. The Happy Honda Days theme seemed to work well. It was highly visible and cut through what was out there. The new Odyssey van has come out and has been very successful. That has been a No. 1 selling van for a while, and this was a great product continuing to get better. The Accord, with improved fuel economy, was exciting for dealers as well. Dealers are hoping Honda can reassert the position of fuel economy leader across the board, so the Accord was nice to see. How do you see 2011 shaping up for the industry? I hope the industry gets to a big number, and that all manufacturers do well. I hope the economy improves enough that employment and consumer confidence returns, and people can enjoy buying a new car instead of being forced into it. Why do you think Honda was unable to match the retail sales gains of the rest of the industry? There were some things we tried, like the zero-drive-off campaign and Happy Honda Days, which were successful. But it also showed that we can improve our marketing. People were coming into dealerships last year because they had to, not because they wanted to. People are more optimistic now, and we are hoping people are buying now because they want to. We should give people more reasons to buy a Honda. Are you saying Honda's marketing is off target? Dealers would like Honda to be more aggressive with their marketing. Honda is best when, at the corporate level, we are selling the attributes of the brand, and the dealers are selling the deal. But those lines got blurred a little bit and Honda went too far down the sales funnel. Honda should tell what makes a Honda a Honda, and not the $199 deal. If you start chasing that deal, it gets to be a pretty dark path. Honda should be talking about durability, quality, reliability and the environment. Everyone thinks this will be a better economic year, so everyone needs to remember the car is the star. What about Honda's overall marketing strategy? The agency showed us a study of dealers and consumers looking at car advertising. They gave totally different reactions. Customers are much more interested in a story, a value story as opposed to a payment. When the payment message goes up, they tune out. Honda is well respected. If we can tell a story of the brand, that will connect with more people. I don't mind us chasing the deal in a year when deals were few and far between, but I don't think it's the most effective strategy. What will the big issues for Honda dealers be in 2011? We have two big launches of Civic and the CR-V. The Civic is coming in the spring. It's one of our core products and it appeals to a broad base of people because it ranges from a hybrid to natural gas to a sporty coupe. We're counting on Honda to launch it well, and Honda is saying they are going to put more money behind this launch than any product ever. But it's not a matter of dollars anymore. The other launch is the CR-V in the fall. It has done great in that category, and has sold without any incentives for all these years. The one we have right now is the best we've ever had, so hopefully they can make it better. We've been talking about owner loyalty for a long time, for years. A couple years ago, Honda put together a loyalty task force. We might think of loyalty as the punch card at the coffee store, or United Mileage Plus credit card, but Honda is finding out it's more than that. This is a huge companywide initiative, learning what is conducive to loyalty but also what is a detractor. One part of our customer ownership experience is getting them into the service drive for that first oil change. We've gone through two years of fixed operations being more important, so we're taking a more aggressive approach to what loyalty is. We do pretty well in owner loyalty, but how do we make that even better? Honda is looking for some predictors. How much real contact do dealers have with factory management? Certainly the senior management picks up the phone. John Mendel is as accessible as he possibly could be. Same with the two senior sales guys. But I also told John that it would be effective if the dealers had a monthly or quarterly communication via e-mail or video with him, and we're moving in that direction. He's our coach, and to hear it from the coach is hugely effective. He knows things that local dealers might not know. If sales are going well in Florida, I want to know about it. Give it to us straight. We can deal with it. Are dealers satisfied with Honda? Dealers are satisfied, but we are very aware that the competition is closing the gap and we want Honda to reassert our leadership. We want to get back to the big numbers. Are Honda dealers profitable? Do you expect to be profitable in 2011? Yes. I haven't seen the annual numbers, but from what I have seen, yes we are. On our interactive network system, rolled out last quarter, Honda provided a fixed-operations tool that would allow every dealer to seem as though he was in a 20 Group. At the click of a button, we can see what 80 percent fixed-ops coverage gets you. It is a very comprehensive tool. Can the Honda Accord ever surpass the Toyota Camry as the top-selling car in America? It depends on how we keep score. If it was a retail-to-retail base, I would say absolutely, especially with the improved fuel economy we have, and the car is quieter. But if the competition comes down to last-quarter fleet sales, we don't play there. There's no doubt we compete with Camry. As long as I've been a Honda dealer, that's been the case. But I don't think the consumer weighs who was No. 1. They are interested in value, features and benefits, and how the car drives and what it costs to operate. That's all more important than who won the sales trophy last year. I've lived a great life as a Honda dealer, never woken up worrying about that. Accolades are interesting and everyone likes them when they win. I'd rather have a five-star crash rating to talk about than be the No. 1 seller. What has Honda told dealers about the upcoming Civic and CR-V redesigns? They have been pretty close to the vest. We only see the pictures with the black tape. I hear rumors that the technology aspect is amazing. I am seeing more signs that Honda, when they redesign the car, is not just about styling but interior content. Is Honda doing its hybrid-vehicle strategy correctly, in comparison with Toyota? Why is the Insight failing to gain traction? Hindsight is 20-20. One of the things we would like to see Honda do is market a comprehensive hybrid strategy, to show how many hybrid products we have. We have lots of good products, and not many people know what they are. Toyota has bought and paid for their environmental positioning, while Honda just has made a great car. We have not had the success. But we have a really great alt-fuels story. Dealers love it when Honda says, "We make trucks," instead of, "We make a Pilot." We want Honda to do that with the hybrids. What's missing in the lineup? Does Honda need an S2000 again? I'd like to see that again. Honda also made a decision to discontinue the Element, and I think we need something in that segment. It was meant to be more youthful than it ended up being. But we need something edgy, more alternative to just a Civic sedan or coupe, something with a more utilitarian feel to it. When I used to go to Japan, I wanted every car I saw to come over here. There are a lot of good alternatives over there. There is a need for something larger than a Fit but with the capability of all-wheel drive. What are Honda dealers doing to attract more service business? They just launched a new program with comprehensive training of our service advisers. For years we could just say "Your car needs a ... " and the customer would say "OK." But now people need more information, and there needs to be more understanding by the customer. Honda is helping us with that.